We remind users that, in addition to the on-line DRS software running on the sophiedrs worsktation which processes SOPHIE data automatically, all data products can be displayed and analyzed using the off-line DRS software running on the same machine. The raw data for a given night are stored in a sub-directory bearing the name of the night (format: YYYY-MM-DD) in the /data/raw directory. The reduced data are stored in a similar subdirectory in the /data/reduced directory. The 40 échelle orders lie in the vertical direction, with red to the left and blue to the right and wavelength increasing towards the bottom. These images have overscan areas of 53 pixels on both long sides where the bias values are systematically measured. Warning : At present no allowance is made either for dark counts or for scattered light. The level of scattered light is small (<1%) but plans are to reduce it as much as possible. The dark level is very small (< 8 e-/pixel/hour). A future release of the DRS software will include both these corrections. The bias noise pattern visible when using the "fast" readout mode has now been considerably reduced. We do not recommend at this time using the "medium" readout mode due to irregular banding in the bias. All FITS keywords now contain valid information. If science observations are made using a simultaneous Thorium exposure using the B fiber, the Thorium information is automatically processed in order to correct for any instrument velocity drifts. Users should be aware that spectra using this mode are contaminated by spurious reflections within the spectrograph due to strong infrared emission lines due to Argon. A special filter was installed on 10 April 2007 in the Cassegrain bonnette to suppress those lines. Previous to that date all spectra taken in the simultaneous Th mode were subject to this contamination and are not suitable for continuum studies. e2ds : This 4077x39 file contains the extracted spectrum (converted in electrons) in pixel-order space. The associated 'wave' file giving the wavelengths for each pixel is specified in the header by the OHP DRS CAL TH FILE keyword. The 'e2ds' file is the result of bias subtraction, optimal extraction using the Horne algorithm, cosmic-ray rejection and division by the spectrum of the flat-field (whose file is specified by the OHP DRS CAL FLAT FILE keyword). No scattered light or dark count corrections are applied at present. In addition to the standard information the file header also contains: order localization information, FWHM of orders, RMS of flat used, S/N for center of each order, number of noise spikes removed, wavelength transformation coefficients and the barycentric radial velocity correction. Note that this file has not been corrected for the blaze function. s1d : In this file, containing 307125 flux values, the orders have been divided by the blaze function, order by order, and reconnected. The resulting spectrum, now relative to the Tungsten lamp, has been re-sampled with a constant wavelength step of 0.01 Å and includes the barycentric radial-velocity correction. Note that this step is smaller than the original spectral sampling. The file header contains values for the signal-to-noise ratio of individual order centers. At present there is no correction for scattered light nor for dark counts. For science observations using both fibers A and B, for example if the sky spectrum is needed, each fiber is reduced separately. No automatic sky subtraction is done (but see below for the ccf). 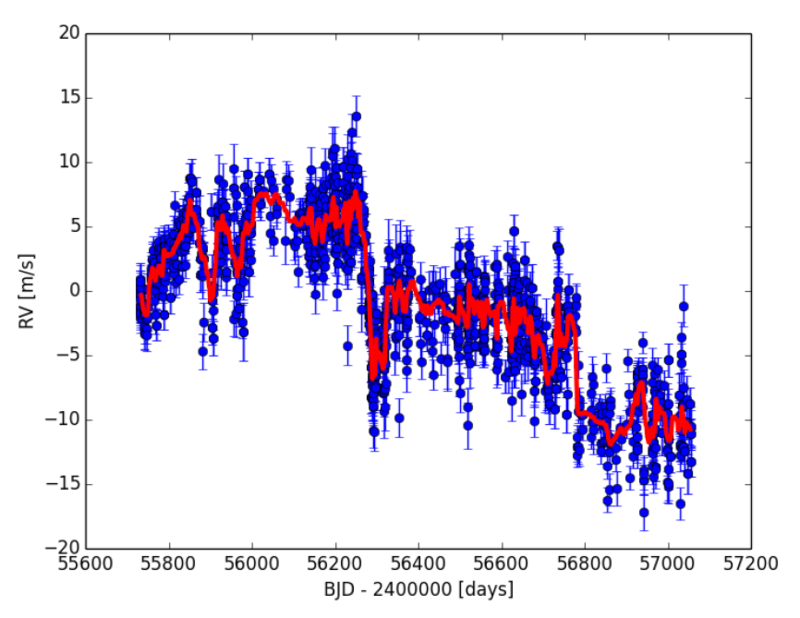 See examples of e2ds and s1d files in the case of a hot star (HD 34078) observed in HR mode. In case the user needs to work with spectra having the original sampling, a MIDAS procedure is available to create a file (in table format) for each échelle order, from the e2ds, wave and blaze files. In this procedure the blaze file is normalized to 1 at order 20. 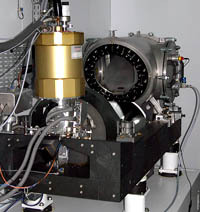 The science exposures are subjected to an automatic cross-correlation process using the spectral type information given in the relevant catalog entry. If no spectral type is specified, or none corresponds, it is correlated with a G2 mask. The CCF is calculated over a ± 30 km/s interval around the deepest peak detected and a gaussian is fitted to the profile. The derived velocity includes the barycentric correction. a 39-line ASCII (.tbl) file, with detailed CCF information for each order. One set is written for fiber A and another for fiber B, if it was used. Here mm stands for the mask used (F0, G2, K0, K5, M4 and M5). The file headers include the average barycentric radial velocity as well as the S/N ratio for each spectral order and the wavelength transformation coefficients. an ASCII (.txt) file with the average CCF. If fiber B was used for the sky spectrum, a newccf_G2_B is also written with the result of cross-correlation with a G2 mask. In addition, the observer can obtain another newccf_mm_C for the sky-subtracted stellar spectrum. Here also mm stands for the mask used (F0, G2, K0, K5, M4 and M5). Errors on measured radial velocities are given in two FITS keywords : For high S/N (>100) spectra DVRMS is a reliable estimate based on the photon noise in the spectrum itself. For low S/N (<100) spectra a more realistic error estimate is given by CCF ERR which is based on the width and depth of the CCF profile and the S/N level. For very accurate radial velocities (down to 2 m/s), a zero-point drift correction as a function of time ((from mid-2011 through early 2015) is available for SOPHIE (see Courcol et al. (2015)). Warning : One hundred SOPHIE spectra taken in September, October and December 2006 and February, September and October 2007 are affected by inexact barycentric corrections (found in the keyword OHP DRS BERV) due to a missing decimal point in the catalog declination (found in the keyword OHP TARG DELTA). Users wishing to recover accurate velocities for these observations are encouraged to re-compute the barycentric corrections (note added 2 April 2017). CCF_results : Here are given the results from the on-line cross-correlations, including: mask, number of lines used in mask, contrast, radial velocity and FWHM of CCF dip. drift_result : For spectra taken with simultaneous Thorium calibration in fiber B, this file is a summary of the velocity drift (m/s) for the Thorium spectrum, expressed relative to a previous spectrum taken as a reference. YYYY-MM-DD.r : This file gives a list of all exposures with the raw file name, the exposure time, the number of the exposure in a given multiple-exposure sequence and the template used. A list of all raw data exposures for a given night can be generated manually using the off_list_raw.py YYYY-MM-DD command. A copy of all valid reduced Tungsten and Thorium calibration files is kept in the /data/calibDB directory.